Recently, I’ve been told that my beer does not have enough foam. I’ve also been told that my beer has too much foam. In both cases, the arguments were linked to products that could either add to a beer’s head, or reduce it greatly. I first learned of my potential foam problem last autumn at a trade show in Las Vegas when I was introduced to the Sonic Foamer—a plastic device that is shaped like and resembles one of those doohickeys you get at restaurants while you’re waiting for a table. You know, the kind that lights up and buzzes when the host is ready to seat you. It’s a fine device and occasionally fun to push a button and watch carbonation rocket upwards. The only downside—aside from the occasional battery change—is the water droplets that fall from the bottom of the glass onto your shirt as you drink. But, why should we care about foam? Do we really need a device that foams up our beers? I asked Grant McCracken, a brewer with the Boston Beer Co., makers of Samuel Adams, to weigh in. That’s exactly what the makers of another foam enhancing device want you to think of when it comes to their product, the Menu Beer Foamer. 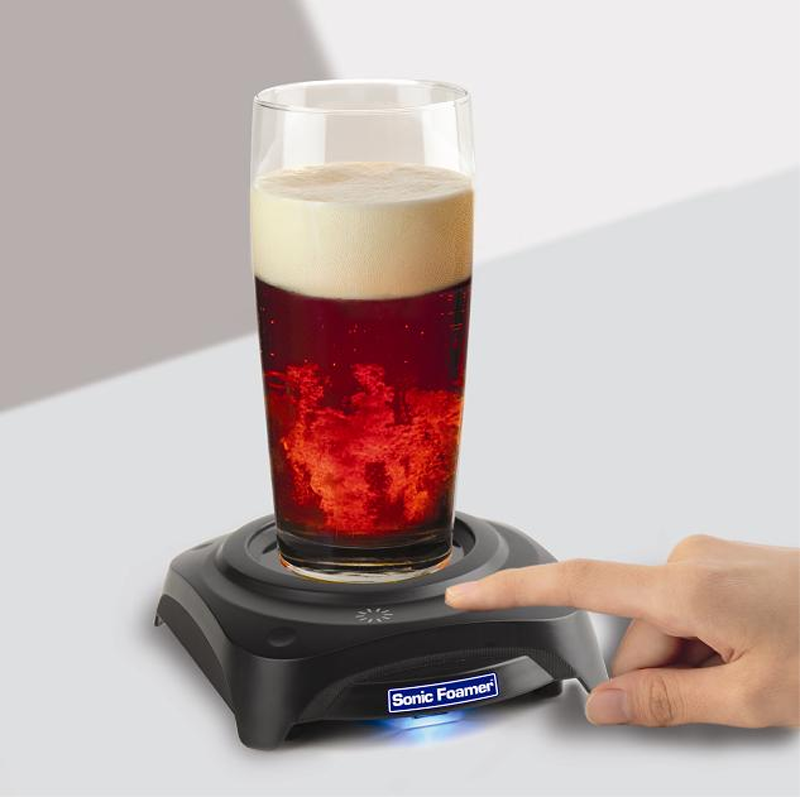 It resembles a milk frother without the heating element, and just asks the user to pour up to ½ inch of beer into the device, let the whisk do its thing for a minute or so, and then pour the dense foam atop the rest of your already poured beer. A video of the product in action may be found here. As a brewer, these gadgets are infuriating. If you can’t get a good, persistent head from your beer when poured properly into the correct glassware, the problem lies in your brewhouse. And if your taproom staff or wholesale accounts aren’t presenting your beer correctly, fix it through training, not geegaws. The alternative is just lazy. With the Sonic Foamer, I think it’s cool because when are half way down your glass, you can put a nice perfect head back onto your beer. Also think that anything that promotes drinking good beer to the masses is a good thing as it pushes brewers to push the limits. more foam , less gas you drink , more room for beer ! As a certified cicerone I completely agree with Scott Petrovitz. A properly balanced draft system and a beer brewed half way decently will have and retain head just fine. These are nifty novelty items, no more. This whole article is a joke, right? I’m a bit surprised at the responses from many so called beer enthusiasts. Not all head is created equal. Many times, I’ve tried to replicate tap head by how a pour the same beer from a can or bottle. It’s never the same. While this device doesn’t claim to replicate tap head, it does claim to produce a different head than that you get from pouring beer from a can or bottle. It creates a very fine head, that has a very small impact on the carbonation of the beer. The claim is a very smooth a fragrant head. I’m very tempted to give it a try.